Neuroscience tells us that multitasking is an illusion. The brain is only designed to work at one task at a time. Have you ever picked up your cell phone while driving? How about answering the phone while typing at your laptop? Have you tried watching a film while talking to a friend? Which part of the conversation and how much of the plot could you remember afterwards? We are all guilty of trying to juggle things like that. Technology has made it easier. The environment has made it more acceptable and popular culture, with its fascination and, even, admiration for multitasking, has made it desirable. We want to feel that we can juggle it all and we tell ourselves that we can do it. Yet we are fooling ourselves and our brain is playing along by refusing to tell us. Part of the brain’s survival mechanism is sensemaking. As neuroscientist and author Bruce Hood said in The Self Illusion the brain is at its best when it can take disparate pieces of conscious and subconscious information and stitch it into a seamless narrative that appears to have a coherent, continuous beginning, middle and end. 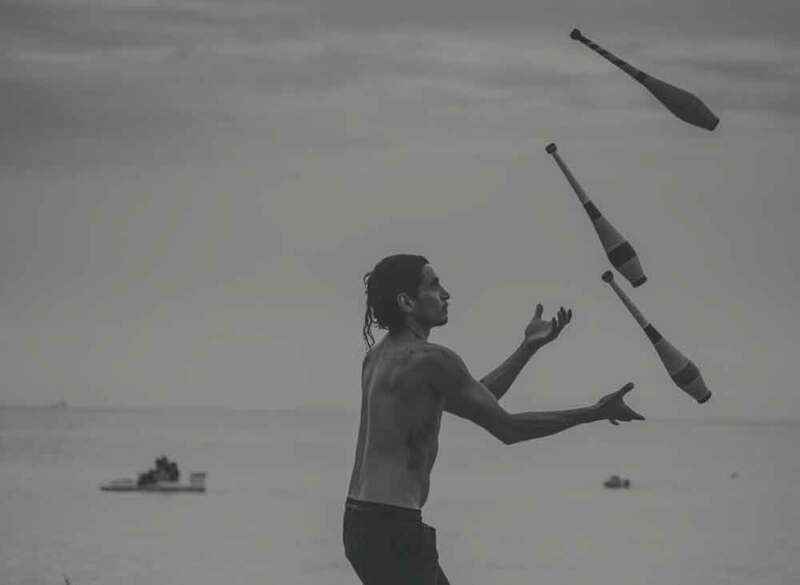 When we multitask we have the impression that there is a cohesive, always alert sense of self, the “I” that simply picks up odd pieces of information, tasks and activities and juggles them all not unlike a juggler keeps up a number of balls in the air and keeps adding to them as he goes along. But multitasking is not juggling and the brain in incapable of adequately paying attention to more than one task at a time. So what happens when we multitask? To understand this we need to look at how the brain allocates resources and what mechanisms it uses to do so. One obvious one is vision. Being mostly mental vision engages a large number of the brain’s centers that are recruited to help analyze and make sense of what is being observed. This is something that magicians, for instance, intuitively understand and make use of in their illusions. The other one, which is directly related in this, is attention. Vision and attention can be thought of as two sides of the same coin. They are engaged to help map and analyze what we value. Whatever they are directed towards is regarded by the brain as being of value. When we multitask the brain, instead of seamlessly stitching activities together as part of a person’s MO, simply switches its attention from one task to another. While we may be perfectly capable of doing either individually, doing both at the same time is impossible. To manage them however and give the impression that this is what is happening the brain switches attention back and forth between the two. It is, for instance, paying attention to what’s happening on the road and listening for auditory clues and building up a mental picture of the conversation you’re having on the phone. Switching from one task to the other the brain raises a cost that is called task switching cost. This is energy intensive which means it will deplete the brain’s ability to perform a particular task for long. Its true cost depends on a number of other factors such as familiarity with the tasks, the number of times the task switching will occur, the complexity of each task and other evolving factors which change things in the process of task switching. While the brain is switching from one task to the other its attention is on hold for the brief time interval required for the switch to occur. This is called attentional blink but it is also referred to as “attentional blindness” and “inattentional blindness”. Consider that it’s impossible to adequately answer a complex email you’re typing on your laptop while your best friend tells you about their breakup with their partner on the phone. Your attention is, really, on neither as your brain switches back and forth from each and, as time goes on, the attentional switch time becomes longer and longer and the attentional gaps generated create less and less of a cohesive picture. In short, you’re failing to live up to your “best friend” billing and are doing, at the same time, a very poor job at replying to your important work email. In complex activities that involve strategy, spatial skills, visual acuity and complex mental modelling like boxing and martial arts there is a feigned attack where a punch or a kick is aimed directly at the face and the eyes even though the target may be just out of range. The intent is to trigger the brain’s blink response where the eyes blink, the brain becomes engaged in processing the attack and a microseconds long gap is created that allows the attacker to close the distance and deliver a proper blow. Consider that there are additional costs to the brain’s resources associated with the spatial change of paying attention to something near and something distant or, in close-quarter conversations with multiple people, from one person to another. You begin to realize that multitasking is something the brain cannot comfortably handle and it certainly cannot perform that with any degree of efficiency. Some studies suggest that multitasking, an evolutionary adaptation is actually damaging the brain. A study from the University of Sussex shows that constant multitasking can damage your brain. People who multitask were found to have lower grey matter density in an area of the brain that handles empathy, emotional control and cognitive control. Lower empathy delivers a disadvantage when it comes to actually visualising another person’s condition or point of view and an inability to control emotions is a recipe for over-reaction. Other studies point out that effective multitasking, as sniper training has shown, can be achieved within specific parameters but specific mental training is required when that training lacking the brain is overwhelmed. We can learn to apply these in either our professional or personal life to great effectiveness. The complexity of the world we live in is not going away. Our jobs and the tasks involved in them are not going to get any easier. If we fail to adapt, we are setting ourselves up to fail. David Amerland is a business journalist, author and international speaker. His latest book "The Sniper Mind: Eliminate Fear, Deal With Uncertainty and Make Better Decisions" is a handbook on how to become exceptional in whatever path you choose by understanding how your brain works.